Tom alerted me to this video. It is an approach to dealing with the situation we face resulting from peak oil. One thing it doesn't talk very much about is the wonders of small community and the richness of hands-on engagement in life. There are a lot of things we should be very concerned about and there are growing dangers from the ways we live in disregard to the environment, but we also need to look at those very positive aspects of community, mental health, and sense of wholeness that arise when we are actively producing and creating and growing with our own hands. When we begin to see the future as something glorious from our past we can encounter it without fear. Today I added more boxes to my Etsy store. 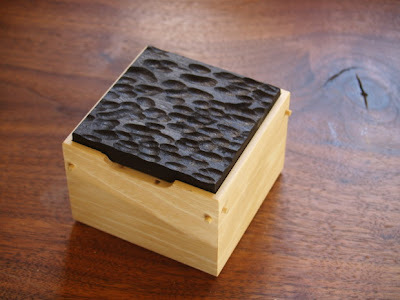 The lid of this box is textured with a common angle grinder and coarse sanding disk. You work your way down the board while it is clamped firmly in place, then cut the board into pieces sized to serve as lids. They are then sanded and stained with leather dye. As we await the goods from overseas that will fill our landfills, we give little thought to the ships that carried the goods and the fact that they will also become obsolete and require disposal. Even the vast cruise ships that carried us on such sublime escapes at some point face the breaker's ball and torch. We may feel pride in the things we acquire, but is there also a sense of shame when we become aware of the costs? I am reminded of an artist friend who was moving from Eureka Springs to Santa Fe. He had lived in the dark for months as he worked on a sculptural installation by flashlight. It was an artistic conceptual investigation of dark things, like viruses and disease. I saw him one day as he was preparing to leave, and I asked him what would happen with his work. "That's taken care of," he said. "I composted it. It was all biodegradable." What if all the important objects in our lives came from the raw materials and labor in our own communities? When we saw something made of wood, we would know the tree that supplied the lumber. When we saw an object, we would identify it with its maker? We would have a sense of admiration for each other, and a sense of responsibility in the ways we engaged with nature. So now, how do we recreate a world in which everything matters? It can start in our own hands. I am having fun with my new boxes. 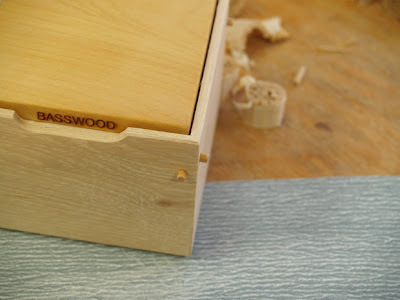 The one shown below has a basswood lid. 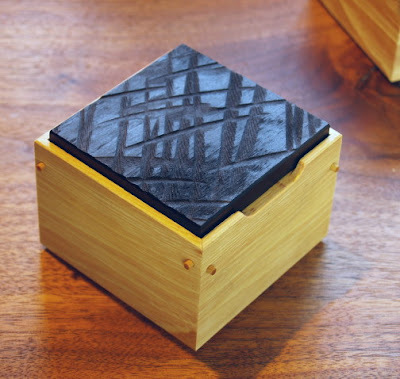 It's texture is carved with a rotary chisel and it has been colored with leather dye. "Peter Kraus, a former top executive at Merrill Lynch who received a $25-million golden parachute after only three months' work, has landed himself a $37-million Park Avenue pad. Kraus, 55, doled out the staggering sum for the five-bedroom co-op at 720 Park Ave. near East 70th Street after taking $25 million from Merrill after the company was sold to Bank of America in September." 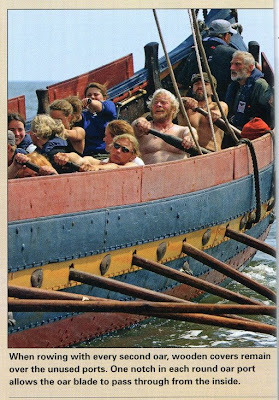 The photo above is from an article in this month's Wooden Boat. A team of 62 rowed and sailed an authentically hand crafted 100 foot long replica of a Viking craft from Ireland to its small port outside Copenhagen. So why would anyone do such a thing when they could be in a Park Avenue pad instead? It is a question of values. The hands and their use impart a greater sense of commitment and loyalty to cultural values... values that seem to be missing from large parts of today's get-it-while-you-can society of Wall St. bankers and money managers. Of course I may be making an unfair generalization. Peter Kraus may be a fine and intelligent person who just lucked into a situation in which he gained benefits he did not earn. Perhaps inside his heart, there is a seaman or craftsman ready for release in service of humanity. He is now CEO of Alliance Bernstein, a company which handles retirement accounts for thousands if not millions of Americans, so we can wait and see. In the old days the more cowardly pirates used false lights to lure ships to break upon shoals. The ships, broken, the crews drowned, goods would float to shore. Not 25 million dollar mansions, but things claimed as fair bounty from the sea. You can ride the elevator up to your new flat and forget the broken ships and the dead, don't you think? One of the primary purposes of incorporation is to shield investors from liability. Investors can only lose their investments, not be penalized for the wrong-doing of the corporation. So, in essence they are free to participate knowingly in the profits from the malfeasance and irresponsibility of the corporations in which they invest without being held accountable as would people committing the same acts. In order to accomplish this, "corporate personhood" was established, giving each corporation all the rights accorded an individual, without holding the corporation responsible in the same ways as an individual. You can send a corporation's officers to prison for their illegal acts, but the corporation and its investors can skate off scott free. So look around at the state we are in. There is a movement afoot, or "at hand" to change the laws regulating corporations to remove their "personhood." In any case, this is an issue we should get more acquainted with. Should corporations be afforded more power and influence than real people? You can begin your investigation HERE! I am using a new run of boxes to experiment with designs. 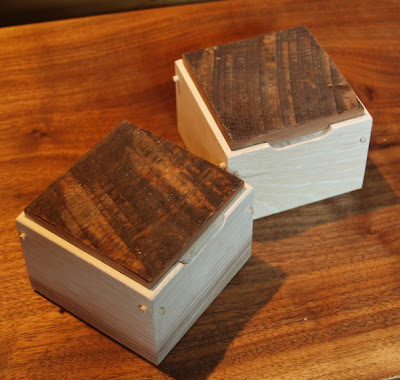 These boxes have the natural texture from the saw mill and weathering. 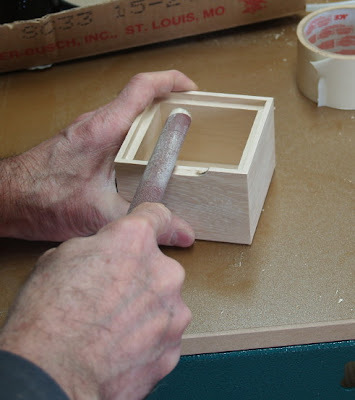 Both the lid, made of cherry and the base made of hickory will darken when the oil finish is applied. In addition to these boxes, I will experiment with some man made textures on lids which I will paint with milk paints for a different look. The photo shown above is a doweled corner for a mitered corner box. 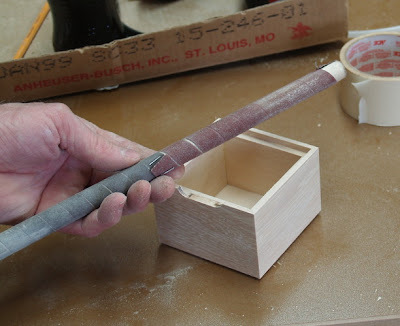 The dowels are held in place by friction, and they intersect to lock the corner even if the glue holding the joint were to fail at some point. But how can a person cut so many dowels to precise length? 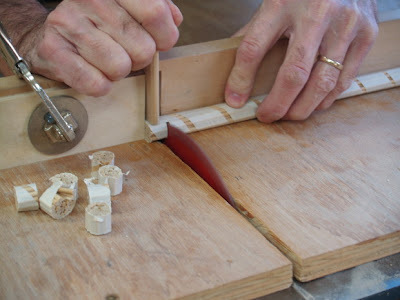 Small pieces tend to fly when cut with a table saw and a hand saw would take too long and the teeth of a handsaw can be disaster on such small dowels. What you see in the photo below is my method. Use tape to secure lots of dowels into a tight mass, then cut using a stick for hold down and stop block to control length of cut. On another subject, I have been contacted by the principal of a high school in New York City about visiting the Clear Spring School program and I have been reading in the Proceedings of the Eastern Manual Arts Training Association Conventions, 1904 and 1905. Back then, there were very clearly developed ideas about the scope and sequence concerning the brain development potentials of Manual Training at various ages. I like to think that this old volume saved from the dumpster and placed in my hands will offer some use as we reconsider American education and redesign it to offer greatest benefit to our children and our society. Also, I have been asked to help with the review and editing of Hans Thorbjörnsson's History of Nääs, which I may do just a few pages at a time to make it manageable. I hope that I will have some interesting things to share from that in the coming year. When I was a kid, I hoped I might grow up to be an inventor, and as a woodworker, I come up with things all the time that fulfill that dream. This is my latest, a dual grit sanding stick. You take sanding roll material that comes from Klingspor's Woodworking Shop at a bargain price. Look for item number BB00001 to obtain a lifetime supply. Wrap a dowel tightly in a spiral pattern and staple both ends. For the other end, use a finer grit. Choose your dowel to fit the profile to be sanded. This morning on the news they mentioned that as many as 26% of retailers may face bankruptcy as a result of a dismal holiday shopping season. In China, toy factories have been shut down and workers have rioted in response. Amazon.com has had a good year, and the internet is providing new ways to connect with each other. I have advocated a return to the basics, a simple life in which we make things for ourselves and nurture each other in ways that are less destructive of our fragile environment and interior sensibilities. I am lucky. I live in a small town in which every trip to the post office or grocery store is a social event. Relationships that have been built on over 30 years of peaceful encounter are a treasure that few people these days have known. Relationships are easily built if your temperament is kindred. They require kindness, consistency, responsibility and cheer, things that can be easy on-line and at your own convenience, but harder when standing in line at the post office. Real life relationships are the best ones and the ones you had best cultivate for the full security of human experience. I sincerely hope that all who happen upon this blog are facing manageable change. I would not wish for things to stay the same. Getting back to basics and strong roots in family, community and personal creativity are the blessings I wish for all. I am reminded of a saying from the last major recession. "Friends will get you through times of no money better than money will get you through times of no friends." Having friends is what makes the difference between change that is manageable, and change that is not. 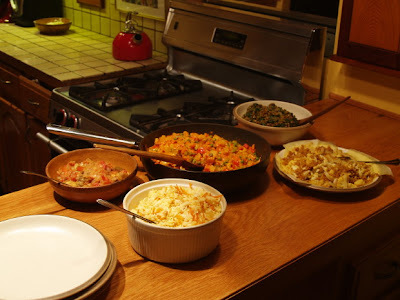 So, if your times are tough, reach out to friends, cook, serve, make and plant. Things will get better, and the friends you make in line at the post office will turn out to be even more valuable than the ones you find on-line. I have been busy setting up my store, dougstowe.etsy.com and I'll let you know if I start selling anything there. I have invested very little effort in marketing in years while I've been busy writing and teaching, but with the economy in decline for the moment, it makes sense to put some effort behind the sale of my work. If you have any handmade products you would like to sell, keep an eye on etsy. You might want to set up a store, too. The Greek legend says that: the giant whom Hercules grappled was invincible so long as his feet were planted on the solid earth. There is danger that our civilization may be developed too much in the air, and we may become too much separated from those sources of strength from which mankind has always drawn its vitality. The whole country is waking up to the necessity of a change in the methods of public school instruction. Let not the teachers lag behind but rather let us be the leaders in the movement. The teacher's profession is a golden one, not in respect to its material return, but in respect to the opportunities it offers. The teachers are the artists who fashion the generations yet to come; upon us more than any other class depends the future of our Republic. Let us stand boldly for the highest aim of human culture and the people generally will more and more rise to the level of appreciating and supporting our earnest endeavors. You may have noticed that I am married to one, but I am also in awe of a librarian at Teacher's College in New York who saved a few volumes for me that are my current bedside reading. I shared a bit from one in yesterday's post, and because some are so long, I may share bits and pieces in the coming days. Lately I've been reading the Eastern Manual Training Association journal, 04-05 which includes the roster of members. The papers and recorded discussion provide an interesting insight that would not be available to me but for a librarian saving these volumes. 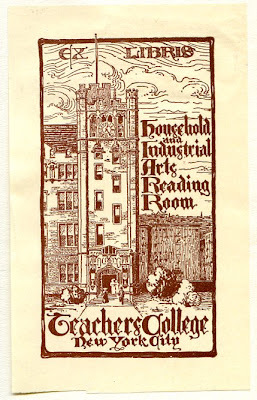 At one time Teacher's College was at the center of an educational movement that prepared the US for its role as a manufacturing leader, victor in WWII and the "world's sole remaining super-power." At the present time, I hope we are reawakening to the fundamental human reality... we have hands and our hands are the source of our wisdom and intelligence. I will try to keep the postings brief. When they are long, it will be because things were so well written and deeply felt, that I have chosen to post unedited. If even those are too long for your patient reading, take the time to work with your hands instead. What you can learn through their patient application may be of greater educational value than even old books can provide. The child who is trained to create, is trained to think, to explore all the questions of the past and present. These single creations in the kindergarten and primary school, crude as they usually are, but expressing the individuality of the child who made them, means opening the way into personal freedom, as self choice is the essential element of liberty. Many young men and young women with perfect physical powers and intellectually capable of developing into strong personalities, wear themselves out as clerks and bookkeepers in our stores because of defects in our methods of education, the education that gave them no opportunity to choose a vocation which might develop their latent energies and talents. As vocation is the fundamental means of putting personality into life, so this hand work in our public schools will allow the children to find themselves and choose for themselves the right places in life-work. One of the greatest weaknesses under which society suffers today is careless work. More people are killed, or worse still, suffer lives of hopeless misery, through bad cooking than through intemperance, and our world is filled with helpless incompetent people who have never learned to do real honest work. The preceding was written in 1905. My daughter Lucy told me about a website where she shops for things that are handmade or vintage. If you are looking for a place to sell handcrafted items you will want to check out etsy.com You can visit my shop now! and see my first listing. I have been reading from the published "Proceedings of the 1904 Philadelphia Convention" of the Eastern Manual Training Association and it illustrates that things really don't change very much and also that when an idea is presented in a variety of cultures, many of the same issues arise. This book is one one of those obscure kinds of things that get discarded when educational libraries no longer see the value of the subject material. In this convention, papers were presented by a variety of teachers, and followed by discussion, giving insight into a variety of perspectives on the material presented. "I am glad to say, however, that I know Mr. Larsson personally; I know the history of the development of the Sloyd Training School; I have come in contact with a number of its graduates; I am cognizant of the work being done with Sloyd as a system; and I feel that there is something in it. I believe that there is real value to it; but I would not hesitate today to refuse absolutely to institute a system—if we may choose to say, called Sloyd, and perpetrate it upon the community and do nothing else in the vast realm of possibilities in manual training matter. I would take the best of Mr. Larsson's work and the best of the individual teacher's work. I have found after well-tried experience that the individual teacher, well trained, energetic, thoroughly conscious of the possibilities in manual training matter, can do far more for the right development of the pupils than thru the slavish adherence to any system already extant, or which, he may be fortunate enough to devise. I have had teachers come to me and say, "I do not wish to undertake this model, or that lesson to-day, I have found a suggestion in the class which I would like to follow up." Now I would prefer to have that spirit in the teacher: that ability to cope with the situation as it develops than ninety- nine systems cut and dried, brought forward as "Courses in Manual Training." I am free to confess that I fight shy of courses in manual training; as a rule they lack vitality. Give me the earnest, well-qualified teacher, and a corresponding alertness on the part of the supervisor and I will guarantee for you that manual training lives! lives forever; cannot die; will not die; cannot be put inside the beautiful graveyard referred to by a previous speaker; it is going to come out thru the cracks and crevices where the grass grows free as nature brings it forth to kiss the sunlight; and that is the real virtue, real life, real hold on manual training in this country today; in that it supplies to the boy and the girl a means of self-expression. The point Mr. Bates makes is that flexibility to meet the interests of the child and to creatively challenge the teacher are essential elements of a successful manual training program. These were the same issues that concerned Otto Salomon at the end of his career, and the same issues that perplex many educators today. We have made education "cut and dried" to make it efficient, and we have lost the heart and soul of it, not for all, but for some, making it oppressive for teachers and students. Fortunately, this is not something wood shop and creatively engaged teachers can't fix. There is a well-documented link between math skills and what is called spatial sense, described by the National Council of Teachers of Mathematics (NCTM) as “an intuitive feel for one’s surroundings and objects in them.” According to the NCTM’s Principles and Standards for School Mathematics, "Geometry and spatial sense are fundamental components of mathematics education. They offer ways to interpret and reflect on our physical environment through abstraction. They support creative thought in all mathematics." One of the best ways to develop spatial sense is to make things. 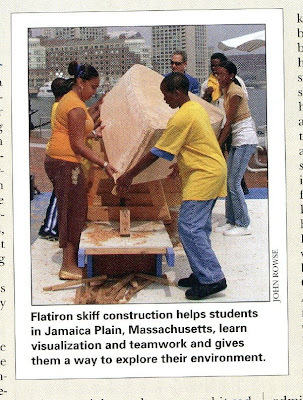 Unfortunately, they have eliminated play with blocks from most schools, parents are giving their toddlers laptops, and we are not exactly moving in the right direction except for some notable exceptions, like the boat building projects in this month's Wooden Boat magazine. Thanks, John for the link. You will note that important word in the Standard's remarks "reflect on our physical environment through abstraction." One of the primary problems with modern education is that we expect children to deal with abstraction without starting with the concrete, as suggested by so many early educators. As stated by Otto Salomon, developer and promoter of Educational Sloyd, "education should move gradually from the concrete to the abstract." Manipulation of real objects, tools and materials needs to be the starting point of all education, and we learn best when we are provided the opportunity to revisit those objects, tools and materials throughout our process of growth and maturity. "the kindergartners saw the logic of breaking things into tenths and being able to see and understand how we were looking at smaller and smaller parts. When a couple of them started reading dimensions to the hundredth place with the decimal accurately placed, it really got me to thinking about how we teach." The answer he believes, is that "thinking spatially is that missing piece." Thinking spatially is indeed a missing piece, and one that wood shops and craft programs of all kinds offered at one time in American education. Remove the hands, you have removed all opportunities for concrete engagement. We expect kids to be engaged in learning without ever having given them any concrete attachment to the subject material. Does it work? Think for yourself how things work in your own life. You may have lots of interests, some idle, some active. How did you get started on the ones that are most compelling? I suspect it had something to do with your hands. 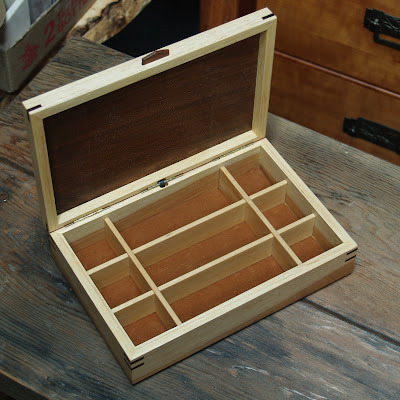 John Grossbohlin made this chest for his wife Michelle to keep important keepsakes in. It is made from chestnut from the fallen limb of a tree Michelle's father planted. You get the idea? a keepsake box, which is itself a keepsake made from material having very special significance to the keeper! And finished just in time for Christmas! Congratulations John, for finishing it in time and with such beautiful craftsmanship. 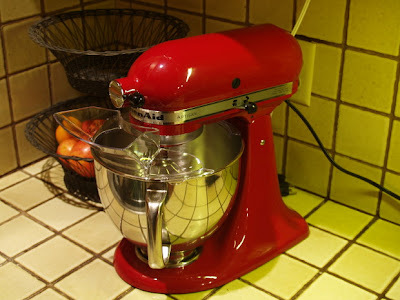 For Christmas I received a stand-up and cheer gift, Kitchen Aid stand-up mixer. It is a powerful made-in-St. Joseph, Michigan tool designed without any notion of planned obsolescence. If Detroit made cars the way Kitchen Aid makes mixers we would not be spending so much money on Toyotas and if we spent our money with long term quality in mind, we would be in a better economic position and live more meaningful lives today. I am a very lucky man. With my daughter Lucy home from college we are sharing time together in the kitchen. She is practicing her cooking skills and Jean and I are helping and reaping the benefits. Shown below is tonight's 5 dish Indian dinner. I wasn't planning to post anything further today, but this came up. When I began this blog about the hands, I wondered about being able to say something about the hands each day. And yet, I have found the subject quite large. The hands quite literally "touch" every aspect of human life. If you are a regular reader, you may feel that I wander off subject at times. I was told by one reader that my posts were becoming too political for his taste. The hands provide a lens on a different view that others may or may not share. As is often said, "your mileage may vary." If you are a regular reader of this blog, you will also have noticed that I tend to repeat myself. I make no apologies for that. A craftsman knows that repetition is the key to refinement and my hopes are that a gradual refinement of message takes place, providing greater clarity. After all, when we reach a level of shared wisdom a single word may suffice. Unless something major comes up, I will take a break from posting for a couple days. I want to thank those who read regularly. There is very little I might say that would be more valuable to you than to suggest you take greater notice of your own hands. And that is my wish and gift for you this holiday season. Despite the slowdown in the economy, the underside of our tree is stuffed with things to be opened. Mystery, anticipation, hopes to please and take pleasure. We will try to slow things down, take note of the mystery and wonder in our own hands as packages are unwrapped and objects are explored. May you have a wonderful holiday season and a great grip on the New Year. I also have a small how-to gift for you. It is a last minute thing and I won't bother to wrap. Photo one below shows a simple squiggle line drawn on a piece of wood that allows me to keep parts in sequence for grain matching. Draw the squiggle offset toward the top edge of the board rather than centered. 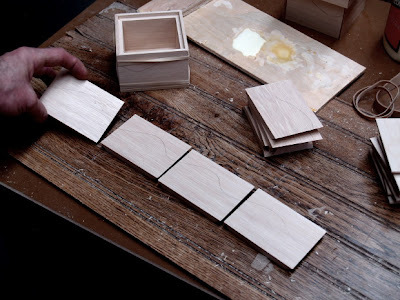 Then when the parts have been cut apart and mitered, they go right back without having to spend too much time studying the grain pattern and without having to number the parts in a more complicated manner. Photo 2 shows spreading glue with the fingers. This is something I learned at school. Make a puddle of glue, dip your finger and spread. 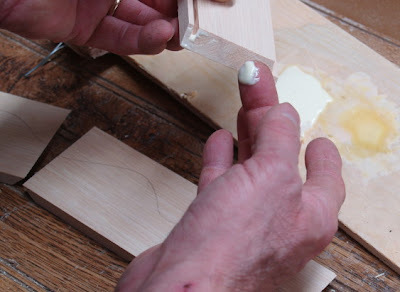 Water-based glues wipe off the fingers easily, and the fingers are the best applicators as you can feel when you have the right amount on the wood. 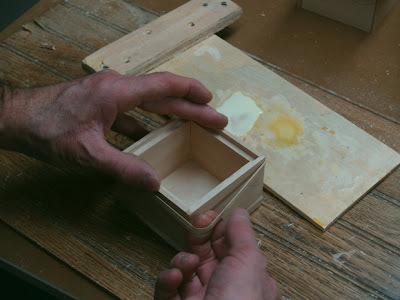 I deliberately place some glue in the cuts made for the bottoms to fit, as in this box the plywood bottom serves as a glued-in-place structural element. 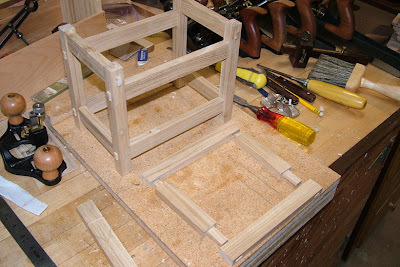 Photo 3 shows the use of rubber bands in place of clamps to hold the box sides together as the glue dries. Rubber bands have a self-centering effect on the corners, pulling them together in a more uniform manner than standard clamps. When you use clamps from opposite sides, the pressure on one has to be offset by pressure on the other and they are incredibly awkward to use on such a small box. Clear packing tape will also work, but the rubber bands are much easier to remove when their work is done, and they can be reused on the next set of boxes. Have a joyous, creative and productive holiday season! 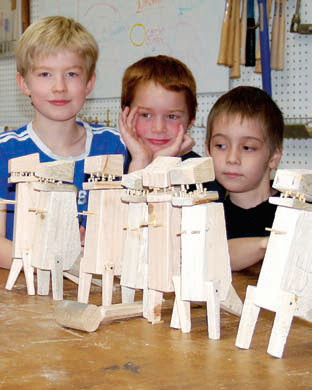 David Radtke's article in American Woodworker magazine about my program at Clear Spring School can be downloaded here. Other good news came today about articles. 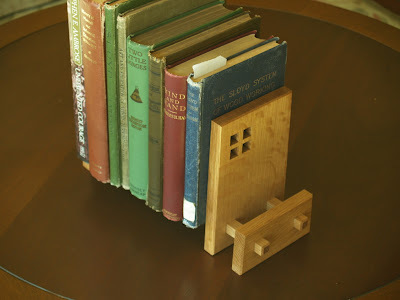 My white oak book rack as shown in the photo below will be in the Summer 2009 issue of Woodwork Magazine. When I was in high school and college I worked summers and holidays in my father’s hardware store and would slip away for an hour or so each afternoon to restore an old car under the guidance of a master craftsman. He said one day, “Doug, I don’t know why you study to be a lawyer, when your brains are so clearly in your hands.” His comment was prophetic. It led me to reexamine my academic path, alerted me to the pleasure I received in learning and working through my hands, and ultimately caused me to question the artificial and unproductive separation between hands-on learning and academic pursuits. 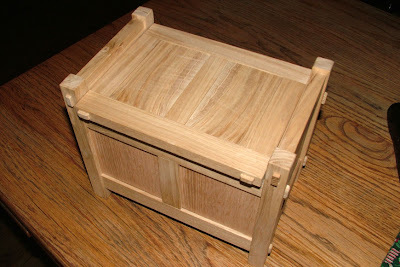 I became a professional craftsman, and then author of woodworking books and articles. You may have noticed that in most schools, wood shops have been discontinued to allow greater emphasis to be placed on academic studies As a craftsman, author and parent, I had found myself in conversations on the internet in which I learned that wood shops were no longer considered relevant in our “information age”, and that we would all earn our livings by moving electrons from one server to another. Instead of making things would buy everything we needed from China or some other developing nation. Something else you may have noticed is that according to widely published statistics, over 30 percent of American high school students fail to graduate. An additional, but unmeasured number of our best and brightest students are bored with their high school educations. Add the numbers of disinterested, and deliberately disruptive students who manage to squeak through at graduation, and you might begin to think we could be doing a better job at educating our children and preparing them for their futures. In my own shop I never felt what I was doing was obsolete. Woodworking enabled me to use a variety of skills, integrating the arts, science, history, mathematics and business. 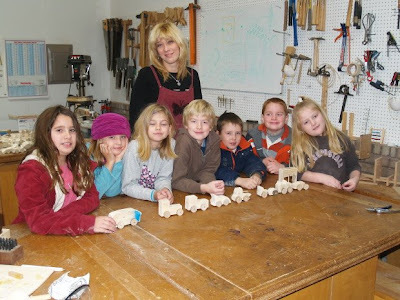 It occurred to me that woodworking in school could become central to the learning experience, making all the other conventional studies more relevant and meaningful to children’s lives. If learning were more relevant, more meaningful and more fun, school would more readily engage our children’s attention and more surely lead to their success. 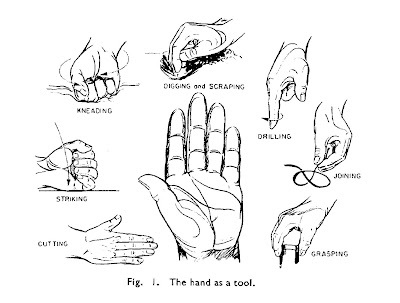 Thanks to my early craftsman mentor I had noticed something about my own hands that I believed to be a valuable tool in education. When the hands are engaged, the heart follows. In the fall of 2001, we launched the Wisdom of the Hands program at Clear Spring School to demonstrate the value of woodcrafts as a part of school curriculum. We named the program Wisdom of the Hands in the belief that bringing the hands into direct action in behalf of learning would enhance learning in all areas of conventional school curriculum and for all students, even those planning to pursue college educations. We started at the high school level and over the next two years, extended the program throughout grade levels 1 through 12. During that time I began my own research on the role of the hands in learning and I discovered that many of my own ideas were widely shared by educational theorists since the mid 1700’s and are very much a part of modern scientific research today. One of my favorite quotes is from Abraham Maslow (American Psychologist 1908-1970): “It is tempting, if the only tool you have is a hammer, to treat everything as if it were a nail.” This tells how much our tools are a part of us, how they influence our thoughts and capacities and perceptions of self. The primary method we use in the Wisdom of the Hands program to interject the hands throughout the school curriculum is through the making of tools, for it is through the use of tools that the hands take their most active role in the expression of intellect. As shown by these drawings from R.J Drillis Folk Norms and Biomechanics, the hands have been the fundamental means through which the world has been shaped, measured, studied and understood. All the actions of machine tools are derived from the motions of the human hand. 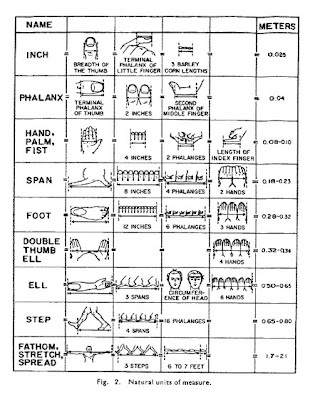 In addition, while the metric system is based on relative abstraction, earlier concrete systems, including our system of inches and feet were based on observation of the human hand and other parts of the human body. “No one knows precisely when our ancestors started handling textiles and manufacturing thread, but our ability to do this, along with many other tasks, was made possible because of two critical and parallel changes in upper limb and brain structure. Biomechanical changes in the hand permitted a greatly enlarged range of grips and movements of the hand and fingers; the brain provided new control mechanisms for more complex and refined hand movements. These changes took place over millions of years, and because of the mutual interdependence of hand and brain it is appropriate to say that the human hand and brain co-evolved as a behavioral system. Current research in the new field of embodied cognition recognizes that the whole body takes part in the processing of information and human intelligence. The idea that human knowledge is “brain based” no longer provides an accurate view of who we are or how we learn. One of the areas of research involves the use of gesture. Work led by Susan Goldin-Meadow , a psychology professor at the University of Chicago, has found that children given arithmetic problems that normally would be too difficult for them are more likely to get the right answer if they're told to gesture while thinking. In fact, students who can use gesture in the solution of algebraic formulas have been shown to be 4 times more likely to get the right answer. Studies by Helga Noice, a psychologist at Elmhurst College, and her husband Tony Noice, an actor and director, found that actors have an easier time remembering lines their characters utter while gesturing, or simply moving. In our nation we have an epidemic of depression and other mental and emotional disorders and use of anti-depressant medications have become common for controlling mood and behavior. I came to my own conclusion that much of the problem has been that we have been out of touch with our own hands, and while being out of touch has disastrous consequences in our lives, it also has profound detrimental effects on the education of our children. The Wisdom of the Hands program is different from conventional school art classes and is different from conventional woodworking programs as well. Each project is planned in cooperation with core classroom teachers to integrate with current studies. By making our own tools at Clear Spring School, we establish a relationship between the materials drawn from our environment, and the student’s growth in confidence by capitalizing on the child’s natural inclinations toward creative activity. We make tools that fit a variety of different categories, each intended to enhance the school’s basic curriculum. Some of the tools enable children to do work, while others are used to expand the children’s understanding of concepts. Some are used for investigation and demonstration of scientific principles, some are used for organizing and collecting data and still others provide additional interest in classroom activities. •Working tools are those that provide the children opportunity to do other projects, often involving crafts. Examples are looms for weaving, knives for carving, pens for learning cursive, and pencil sharpeners among others. •Conceptual study tools include geometric solids for the study of geometry, math manipulatives, models of the solar system, puzzle maps for study of geography and plate tectonics. Abacuses for doing math problems and developing numerancy. •Organizational tools include divided trays for the collection of rocks and minerals, display boxes for collections of insects and numbered stakes for marking plant species on the school nature trails. By being deeply immersed in exploring the fundamentals of physical reality, and making his or her own tools for discovery no child is truly left behind, no child is bored, and every child is empowered to engage in creative response to society and environment. The variety of tools that can be made in the school wood shop is without limit. So what is the difference between making an object and making a tool? 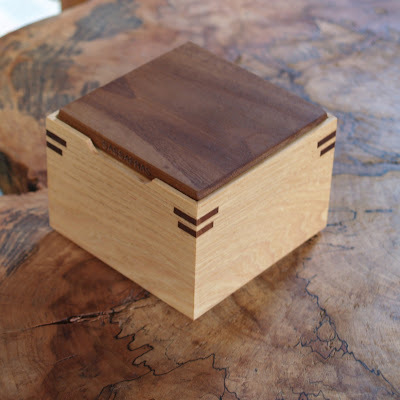 Tools are intended to have use and impact beyond the time spent in the wood shop. As an example, the simple tray made for the collection of rocks and minerals is not complete until the contents have been collected, organized and labeled. A loom is not complete until it holds a completed cloth. A toy is not complete until it has been played with and enjoyed and learned from. Tools have particular effectiveness in bringing the hands to work in the classroom far beyond note taking and keyboarding. The hands’ profound impact on learning has been widely ignored in American education, but offers the pathway to educational reform and renewal. The following is from The Educational Meaning of Manual Arts and Industries by Robert Keable Row, 1909. Psychologists and other teachers are agreed that the most important work in intellectual education is the development of the power of prolonged, concentrated attention. The ability to apprehend facts, to comprehend all the conditions that pertain to a particular situation, to compare and see relations, hence to exercise good judgment, all depends upon this power of attention. We know also, that attention is conditioned by interest, in other words, by the motive. We attend to that in which we are interested, that which we have some motive for considering. All our voluntary activities are directed toward some end, the attainment of something we consider of value. It is a pathetic truism that a considerable percentage of our children become indifferent, idle, troublesome, and eventually leave school because so much of the work provided does not appeal to them as of value. They have no genuine motive for doing it... This psychologic theory has been confirmed by experience. Among the most obvious results of the introduction of manual arts and domestic science into the schools is the fact that many more pupils continue in a school a much longer time than before these lines of work were introduced. This should require no argument. Many children have no direct interest in much of the work assigned in school. The skillful teacher finds a way of supplying an indirect interest, and if this works well a direct interest may develop. But practically all children have a direct interest in well-planned work in manual arts and industries. When a boy elects to make himself a sled, or a girl an apron, there is a genuine motive for every step in the process. The end is seen more or less clearly from the beginning. Each step is planned and executed with reference to the whole. Nothing can be done right without due attention. If mistakes are made they must be corrected. The more complex the project, and the more the worker is left to his own initiative and self direction, the more attention he must give to it, hence, the more training he gets. It follows, then, that under right methods of training (see Chapter XVI) work in the shop, the kitchen, the garden, etc., provides most favorable conditions for developing the power and the habit of attention. 600 men on a dead man's chest. Yar, matey. We're talking like a pirate on Wall St.
"Banks that have their hands out in Washington this year were handing out multimillion-dollar rewards to their executives last year. "The 116 banks that so far have received taxpayer dollars to boost them through the economic crisis gave their top tier of executives nearly $1.6 billion in salaries, bonuses and other benefits in 2007, an Associated Press analysis found. "That amount, spread among the 600 highest paid bank executives, would cover the bailout money given to 53 of the banks that have shared the $188 billion that Washington has doled out in rescue packages so far." This year, I hope things are different. Perhaps execs will fight over the dead man's chest of our current economy. Or perhaps they can work hard to actually earn compensation more closely proportional to the rewards others make in today's economy. As a craftsman in wood, I'm left scratching my head. By doing something that involves development of skill, one discovers that there is greater pleasure in taking the more difficult path. But we have been pumping students out of the ivies, with little connection to hands-on skill, thrusting them into Wall Street, sedating them with monetary rewards beyond comprehension, and then wondering why we face such a distinct decline in economic power. In 1950, the average pay of an S&P 500 CEO was less than 30 times that of an average U.S. worker; by 1980, prior to the "Reagan Revolution, the average pay of the S&P 500 CEO was approximately 50 times higher than that of an average U.S worker. But by 2007, the average pay of an S&P 500 CEO had soared to more than 350 times as much as that of an average American worker. For the sake of comparison, in Europe, an average CEO only makes 22 times as much as an average worker, and in Japan, only 17 times as much. It is fascinating that the Republicans would try to blame the failure of the Automakers on the United Auto Workers. While the Detroit executives were chastised for using corporate jets for their travels to Washington, DC, the now bailed out banks continue to rely on their fleet of corporate jets. Is any of this starting to sink in? Take the hands out of their normal creative function in human life, and you end up with CEO's completely out of touch with the everyday reality of the American people. A reader in Mississippi sent a link to an article about AIG, fraud, cooked books and the lead-up to financial melt-down,"All I Want in Life is an Unfair Advantage". All during the rise of AIG, Enron, and Bernie Madoff's Ponzi scheme, all of which bilked billions from common investors (and consumers), we had an ever more unregulated business environment. The assumption was that if you were that big you had to be honest. In the meantime, the Securities and Exchange commission created a false sense of due diligence by going after small investors. Remember Martha Stewart and the millions of dollars spent to put her in jail? By taking a high profile celebrity and raking her over the coals, the SEC created a false sense of regulatory protection for investors, allowing them to be continuously bilked by the biggies. After all, if they would even go after much beloved Martha Stewart, could any crook get away with such stuff? You might think that all this is unrelated to the hands. Reach for it and you may discover something. One of the things a craftsman learns is the value of simplicity. When things become convoluted beyond all reason, be wary. Complication is the hiding place of those who choose to deceive. Have you ever seen a shell game, or observed a magician doing card tricks? The little extra motions of the magicians hands are what allow you to be deceived and distracted from the important elements of the deal. In a shell game the con puts something under one of three shells and moves them around with the words, "the hand is quicker than the eye." And it is true. The hands of the deceptive CEO are quicker than the government's eyes, especially when they've been taped shut by an anti-regulatory fever. AIG was playing "hide the assets" and "hide the accountability" by setting up fake firms and shifting the assets and accounting and reporting responsibilities from one to the other. All those billions that disappeared? Those were paid as bonuses of successful deceit. I went to Barnes and Noble yesterday and found that their entire collection of woodworking books had shrunk significantly from a book case to a single shelf 30 inches long. Help, I'm shrinking. They had only one copy of one of my books in stock. If how-to books are a bell weather of what is to come, look for us to get dumber and for things to get worse. In the meantime, John Grossbohlin sent a photo of a Christmas project. With just 4 days to spare! This small Chestnut chest, done with through mortise and tenon joints will be a beauty from the arts and crafts design era. The wood is from limbs that came down in a storm. If you are looking for honesty and integrity in today's world, look for things made from real wood and made by human hands. Sorry, no, and sadly, too, you won't find them on Wall Street. When things were simpler, maybe they were better as well. "When toys were magical without being pricey." When you buy a new table saw, the adjustments you make will affect the quality of the saw's cuts for the rest of its life. 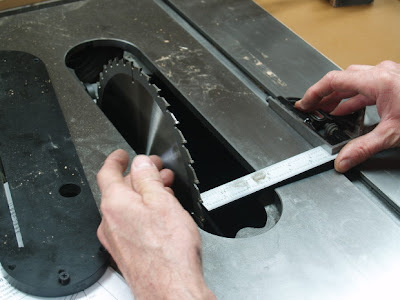 Can you imagine how much extra effort may be required if the blade is not parallel to the miter gauge slots, or if the fence is not parallel to the blade? 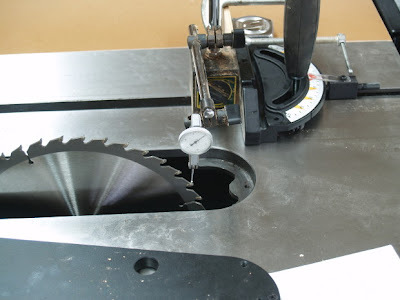 Even the best saw blades won't cut smoothly if the saw is not tuned up properly, and the best saws are never tuned as well as a craftsman would like when they leave the factory. The photos above show the process. Use a dial gauge to check the front side of the blade, and the back side of the blade. 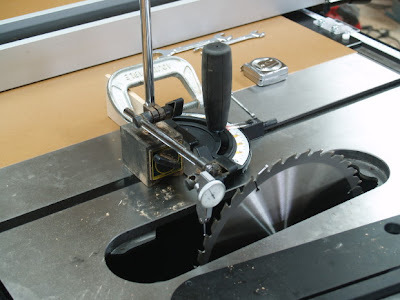 Use the miter gauge and stop block clamped in place to index the gauge so that it is in the same position relative to the miter gauge slot at both the front and back of the blade. If it is not the same, loosen the bolts that secure the table top to the saw. Your manual that came with the saw will show their locations. The Grizzly has three. Adjust the top until the reading is the same at both the front and back of the blade. Almost as accurate is to use combination square as shown the third photo. Set the blade of the square so that when the body of the square rests in the miter gauge slot so that it just touches a tooth at the front side of the blade. Then check the back. 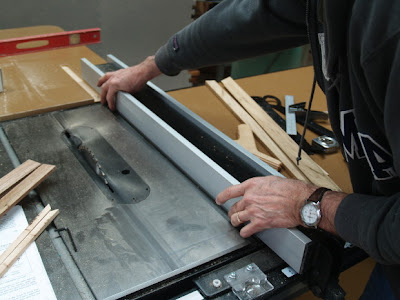 If the blade doesn't touch just the same, front and back, adjust the position of the table saw top so it does. Next adjust the fence. It should be perfectly parallel to the miter gauge slots and you can check by aligning it with the slot and using your sense of touch. The fence will have adjustment screws to allow you to fine tune it to provide a perfect cut.Check your manual for instructions. Now, as soon as I have my saw connected to my dust collector system, I'll be ready for years of accurate cuts. Bank bonuses are way down from 2006 and 2007 when end of year holiday parties must have felt like drunken 18th century pirates sharing the bloody loot from hijacked galleons. No doubt they enjoyed the Pirates of the Caribbean movies on Wall Street. But how many sequels can you do in a row? This year things are different. Goldman Sachs only exists at this point in time thanks to the generosity of the US taxpayer. But it is hard to go cold turkey from the drunken celebrations of financial piracy to the harsh cold reality of the holiday season in the real world most people face each day. This is exactly what Finish neuro-physiologist Matti Bergström meant when he described the syndrome and sequence, "finger blindness" leading to being "values damaged". Extract the fingers from the creative processes, thereby diminishing normal human understanding of the broad range of values inherent in human life, and as a result the single economic value, money, becomes the overwhelming concern depriving the individual of reasonable concern for others. Welcome to the depression... a state of mind as well as an economic condition. The food bank in Eureka Springs is doing well. They fix holiday meals and serve the poor, and there is a richness of spirit that Wall Street bonuses could never buy. Our daughter Lucy made it home from New York for the holiday season despite a very long wait for departure from La Guardia due to ice and snow. Her plane waited on the ground for 5 hours before her 4 hour flight. Her hours and hours on the small plane were made much easier by her heroic flight attendant Reggie, who rose well beyond the normal altitude of holiday good cheer. Can you imagine what people would say if a flight attendant made a $200,000.00 bonus? Or a teacher? Usually the people with the right kind of human values don't ask for such things or require them as their purpose for serving. We will know when our economy is on the right track. Our values will be there first. Cook, Nurse, Teach, Garden, Make. Get far from these 5 and we know we are off the track. But do these and encourage these in others and we will have a revival of spirit and will. My holiday greetings will come to you again and again. May you share the important values with those you love this holiday season. This morning we delivered the toy cars to our local food bank. 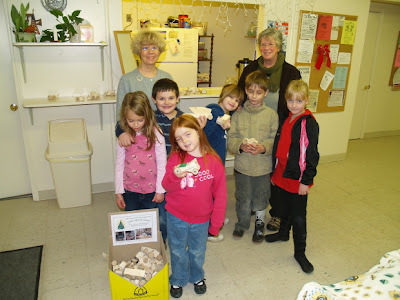 The photo shows the first and second grade class with Food Bank director Pat Kasner. It is important for the children to begin thinking of others early in their lives, and they were proud to show off the cars they had made. Yesterday I had an adventure. I am always hesitant to buy new tools for a couple reasons. First, as an author, I think it is important to share with my readers the concept that having the newest and best tools is not required, and that craftsmen throughout history have used what they have had available to create whatever they want. The other reason I have been hesitant in acquiring new tools is that I have limited space for them. It can get crazy. Buy something new and the whole woodshop needs to be rearranged and something gets bumped. So yesterday, I got word from the freight company that my new Grizzly table saw was arriving at the bottom of the hill. I got on the tractor and headed down to meet it. The long gravel road to our house is no-semi zone. Trucks won't come here. So with the tractor, I lifted the main part of the saw into the bucket and strapped it in place. I loaded the rest of the saw on the forks at the back and brought them home, ever so grateful that the front loader would hold the weight as I bounced slowly up our long hill. This would have been the normal time to enlist lots of helpers, but I like the challenge of doing things myself. The tractor carried the saw up to the side door of the shop. Then I had to build a ramp of 2 x 6 boards to carry the weight of the saw up the low step and scoot the saw onto a 4 wheel dolly. All that sounds simple in retrospect, but at the time, it was not. Now the challenge will be to sell some old equipment and as you can see in the photo below, I have a new table saw to be thankful for, and that will serve well for many years to come. I bought the new saw because of tax incentives, but also because I have been having troubles with an aging elbow and my old saws had become difficult to crank up and down and offer insufficient dust collection capacity. The new saw has a riving knife for greater safety. So, feast your eyes on something that doesn't happen often in my shop. 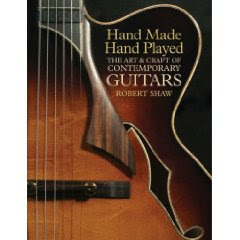 Joe Barry recommends this book, Hand Made, Hand Played: the Art and Craft of Contemporary Guitars by Robert Shaw. In a letter to his friend Juan Martinez Sirvent, Antonio de Torres, the father of the Spanish classical guitar, explained, "My secret is one you have witnessed many times, and one I can't leave to posterity, because it must with my body go to the grave, for it consists of the tactile senses in my finger pads, in my thumb and index finger that tell the intelligent builder if the top is or is not well made, and how it should be treated to obtain the best tone from the instrument." Joe says that each page is a WOW! This youtube video performance by Still on the Hill shows one of Ed Stilley's guitars in action being played for a tune he wrote. Thanks Scrapwood Bob for the tip. "I write this in the belief that, for all-round development of the brain, there should be in elementary and secondary education much more training of the hand, and of the power of expression through the hand, than is customary in the too bookish tradition which has come down to us from classical humanism. Such a subject as history is too apt to pass without challenge into the circle of those subjects which are taught out of books and from a literary point of view. We have to claim it as falling into the scientific division of the course not less than into that of the humanities. And there is need in the teaching of it for the use of the hand and of the constructive powers. From this point of view, handwork in the elementary school is not so much a subject by itself as a form of expression ancillary to several branches of the curriculum, namely, elementary science, geometry, geography, and history." If you want to see these principles in action, please arrange a visit to Clear Spring School, or pay regular attention to this blog. In Dr. Dewey's School at Chicago University The various kinds of work: carpentry, cookery, sewing, and weaving-—are selected as involving different kinds of skill and demanding different types of intellectual aptitude on the part of the child, and because they represent some of the most important activities of the everyday outside world, the question of living under shelter, of daily food and clothing, of the home, of personal movement, and exchange of goods, He secures also the training of sense organs—of touch, of sight, and the ability to co-ordinate eye and hand. He gets healthy exercise, for the child demands a much larger amount of physical activity than the formal programm of the ordinary School permits. There is also a continual appeal to memory, to judgment in adapting ends to means, a training in habits of order, industry, and neatness in the care of tools and utensils, and in doing things in a systematic instead of a haphazard way." Dr. Dewey aims at educating the child through "the interest in conversation or communication; in inquiry or finding out things; in making things or construction; and in artistic expression." There are some advantages to the educational system we have now. By having large class sizes with students emotionally and physically inactive, we have increased the student to teacher ratio and eliminated expense. But we have completely ignored the sound theories of all our most prominent educators. In many respects the organ of touch, as embodied in the hand, is the most wonderful of the senses. The organs of the other senses are passive; the organ of touch alone is active. The eye, the ear, and the nostril stand simply open: light, sound, and fragrance enter, and we are compelled to see, to hear, and to smell; but the hand selects what it shall touch, and touches what it pleases. It puts away from it the things which it hates, and beckons towards it the things which it desires unlike the eye, which must often gaze transfixed at horrible sights from which it cannot turn; and the ear, which cannot escape from the torture of discordant sounds and the nostril, which cannot protect itself from hateful odours. And if the hand thus munificently serves the body, not less amply does it give expression to the genius and the wit, the courage and the affection, the will and the power of man. Put a sword into it, and it will fight for him; put a plough into it, and it will till for him; put a harp into it, and it will play for him; put a pencil into it, and it will paint for him; put a pen into it, and it will speak for him, plead for him, pray for him. What will it not do? What has it not done? A steam-engine is but a larger hand, made to extend its powers by the little hand of man! An electric telegraph is but a long pen for that little hand to write with! All our huge cannons and other weapons of war, with which we so effectually slay our brethren, are only Cain's hand made bigger, and stronger, and bloodier! What, moreover, is a ship, a railway, a lighthouse, or a palace? What, indeed, is a whole city, a whole continent of cities, all the cities of the globe, nay, the very globe itself, in so far as man has changed it, but the work of that giant hand, with which the human race, acting as one mighty man, has executed its will. "I don't b'lieve so," he said. "You think anybody could be a chairmaker?" "No, I don't b'lieve just anybody could... too hard a work." "Does it take some special skill?" "Can anyone learn how to use a drawing knife?" "Anybody could learn how to be a chairmaker, then?" "Well, yes, they could, but they'd have to learn to be interested in that first. You can take an idle interest in something, google it and get more than enough to quench your interest in seconds. You can race from one idle interest to another for years. When you click the window closed, you can walk away unchanged. You can take an active interest in something and it can lead to years of effort, challenge, and reward. So how do we restructure our schools to go from idle interest to active interest? Leading our children in directions of active discovery? It takes the hands. The photo above is of one of Cornett's more conventional rockers. 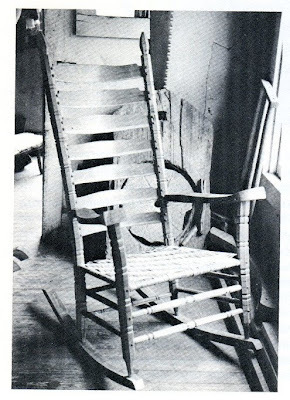 I have been reading Craftsman of the Cumberlands: Tradition and Creativity by Michael Owen Jones about chairmaker, Chester Cornett. I've been finding some similarity between Chester Cornett our local guitar maker Ed Stilley. Both are somewhat enigmatic individuals. Ed Stilley was recorded as a folk musician as early as the 1950's by anthologists collecting the music of the Ozarks, and Ed makes his own guitars which he gives to children to encourage their play. The guitars are made in a wide range of styles, often made with unusual materials, and no two are ever alike. The designs break most of the rules about guitar making, and most constitute some new exploration of concepts more conventional guitar makers would immediately discard as impractical. 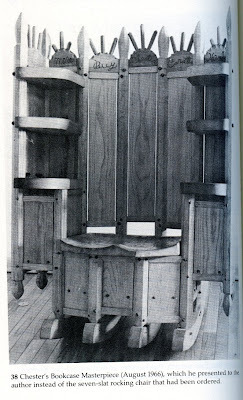 In this way his craft is similar to the creative, outlandish and impractical chair designs by Chester Cornett. Almost all of Stilley's guitars are hand lettered with Christian quotations. Through this link you can hear Ed Stilley Play "in the Pines", a folk classic. 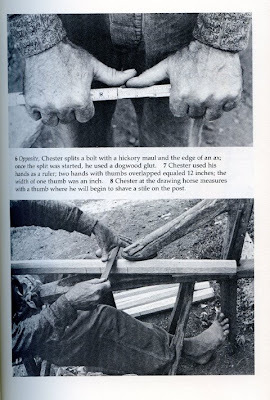 The photo below is of Chester Cornett's interesting way of measuring. With his thumbs overlapped, the full spread of his hands equals 1 foot. I doubt that many viewing the photo at left would understand the skill involved in creating an octagonal shape with such precision using a draw knife. Nor would they understand the level of effort required, nor the emotionally settling qualities of such work. As a test, take a piece of rough wood and a piece of fine sand paper. Sand it awhile and feel its transition from coarse and scratchy to soft and engaging. The tactile and visual transformations that take place in the making of real objects are a form of nourishment. Chester Cornett lived a tumultuous life, disturbed by abject poverty, a failed marriage, and children with severe mental retardation. 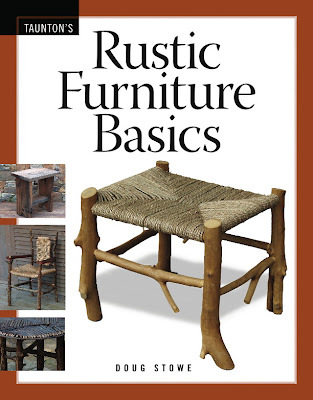 If some of his work seems strange, like the eight legged book case chair at left, remember that for some craftsmen, their work is a form of refuge from difficult circumstances completely beyond their means to understand or control. Throughout this week before the holiday break, the students at Clear Spring school are all making toy cars to distribute to children at our local food bank. Each of our kids get to keep one that they've made for themselves. Some of the first grade students are reluctant to give away something they've made, but by the time they are in 3rd and 4th, they give freely , knowing they can make more. Children quickly learn that giving work away provides the excuse to make more, and the real value isn't in the finished object but in the making of it. The photo above shows the 3rd and 4th grade students with their keepers. Years ago, I had the telephone repairman here to work on our lines. I noticed how he took the pliers and gave a special twist to each loose wire, turning loose ends into tight coils like multicolored springs. I asked him about it. He said that it made things look neater, but also that when other linemen came in behind him, they would know that he had been there. He had found a small way to sign his work that showed he cared about it, and that he took it personally. He welcomed anyone who came along behind him to understand the pride he felt in his work. These days, of scientific testing, we tend to the regard the expression of intellect as being of greater importance than other factors in schools. We test for it through hours of standardized testing, and we hold teachers accountable for their children's performance. As parents we worry about how our children will measure up. Before we get too serious, take just a moment and smile. There is a direct relationship between what happens in the body with how we feel. It has been proved that to alter one's facial expressions has direct impact on how we feel. Move your face into a smile and you actually begin to feel better. Now take a moment to raise your head, lifting your torso into a more vertical posture. You may feel that this also affects your emotions. Back in the early days of Kindergarten, posture was considered an important skill that prepared students for learning. We know that among the various symptoms of depression are loss of memory, and inability to make connections between things, obvious signs of intellectual impairment. Can you see the direct relationship between the body, the emotions, and the intellect? All of this is quite obvious to many in the progressive schools movement, but something that many on the administrative end seem to be missing. And it helps to explain why hands-on activities are so important in schools, and why hands-on learning is so much more powerful than what we may find in books and lectures. The movement of the hands in crafts, music, scientific exploration and gesture directly stimulates the emotional engagement of the child, increasing intellectual involvement in school, increasing mental capacity of each student and both short term and long term retention of skill and knowledge. Need I say more? I guess I could tell about how Clear Spring School uses the engagement of the hands to build greater confidence, emotional engagement and intellect. This is a preview of the cover of my new book coming out in the fall of 2009. 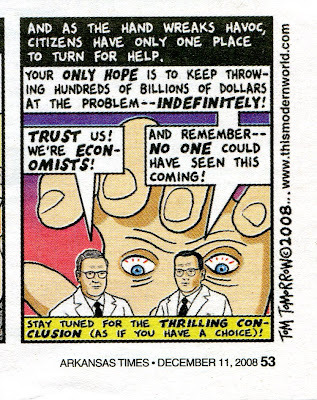 As I was just mentioning the invisible hand of the free market economy, I opened the paper and found this from Tom Tommorrow. Follow the link for the whole sad, frightening and illuminating tale. In the meantime, the Federal Reserve System made 2 Trillion in loans to banks that they refuse to identify. Can you imagine what 2 trillion dollars could have done for education or health care? Home values have dropped over 2 trillion in the last year of the Bush presidency. Can you imagine what 2 trillion dollars could have done for education or health care? 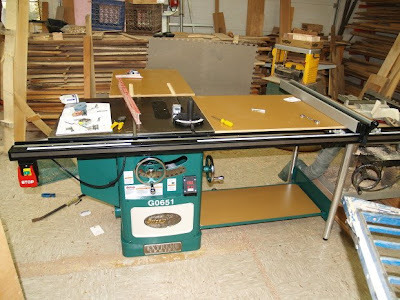 Today I am awaiting the arrival of a new tablesaw made in Taiwan to assist me in my competition with the Chinese. Seems somewhat ironic, don't you think? Current tax incentives designed to encourage business investment made it reasonable for me to buy a Taiwanese made table saw to replace my 30 year old Rockwell, American-made saw. I had been needing to upgrade the saw due to ongoing difficulties with it, the inadequacies of its design to allow for dust collection and its lack of reasonable safety features. Americans gave up the battle for manufacturing supremacy long ago except in the areas of aviation, advanced weaponry and some areas of electronics. My old Rockwell was a dependable work horse, but when the Japanese entered the American market, followed by the Taiwanese, innovation blasted ahead in the available features, ease of use, and safety... American manufacturers gave up the competition, and those remaining in business shifted their manufacturing to Taiwan. So even if I bought an American brand, guess where it would be made? Michael Ruhlman in his book, Wooden Boats talks about the difference between those who make boats, and those who commission wooden boats to be made. There are some that understand the creative process and the investment they are making in the creative lives of makers, and as one would expect, many don't have a clue and are on an ego trip that often puts them at cross purposes to those dedicated to the skill and making of wooden boats. It is those who haven't a clue, educated without experience of the hands, that have brought our economy to wrack and ruin. I have great confidence that the hands of wisdom and experience can put things right. The conservatives have long talked about the "unseen hand of the free market economy," but it will require real seen hands to restore what has been lost. I am reminded of a story about famous Arkansas architect E. Faye Jones. When he was interviewing contractors to build a now famous chapel, he asked, "What kind of nail gun do you use?" One after another the contractors said "Senco. It is the most reliable." The contractor who got the job said, "We don't use nail guns. We use hammers." "When I tire of the computer screen, I can walk twenty steps to my woodshop and immerse myself in my current project," Carter says. And why does an Octogenarian, financially secure, Nobel Peace Prize recipient, Emory University professor, Carter Center (Waging Peace, Fighting Disease, Building Hope.) leader, and prolific author continue to make sawdust? "What we need in our lives is an inventory of factors that never change. I think that skill with one's own hands - whether it's tilling the soil, building a house, making a piece of furniture, playing a violin, or painting a painting - is something that doesn't change with the vicissitudes of life. [Woodworking is] a kind of therapy, but it's also a stabilizing force in my life - a total rest for my mind. And so what if we put our minds to rest? Put our hands to work? We would feel much better about things. No man can reveal to you aught but that which lies half asleep in the dawning of your knowledge. "These universities, because of their incessant reliance on standardized tests and the demand for perfect grades, fill their classrooms with large numbers of drones. I have taught gifted and engaged students who used these institutions to expand the life of the mind, who asked the big questions and who cherished what these schools had to offer. But they were always a marginalized and dispirited minority." This morning, I was reminded of Gibran's quote. The real challenge in this blog is not to educate but merely to awaken from half sleep matters that lie within our own hands. I have been asked, "Does it get boring to do the same things over and over again?" What about the cutting and sanding that must be done if something is to be crafted with precision and care? The wise craftsman uses his attention wisely. He watches the transformation of material. He feels the texture as it moves from coarse to smooth. His mind never wanders, lest his intentions not be met. His attention is too precious to be wasted on the inconsequential wanderings of the common man. As the farmer channels his water, as the fletcher whittles his arrows, and as the carpenter turns his wood, each works to master the landscape of self. The mind wanders. The wise craftsman pulls it back into the moment and invests his attention in task at hand, that it may be done to convey wisdom and love. "Shall We Call It A Depression Now?" just rolled out of bed? replaced by a food processor?